Besieged Veterans Affairs Secretary Eric Shinseki resigned Friday just days after the VA's top investigator found significant issues — including cases of fraudulent reporting — with scheduling practices at VA medical centers. The departure comes following weeks of reports of questionable scheduling practices at VA hospitals across the country that delayed care and may have contributed to the deaths of veterans. On Wednesday, the VA inspector general found that more than 1,700 veterans were left off an official waiting list for primary care appointments at the VA Phoenix Health System, an omission the IG said allowed hospital administrators to receive performance bonuses. Shinseki had promised in congressional testimony and several rare press conferences and interviews "swift and appropriate punishment" for those involved with the medical center delays and cover-ups. And President Obama last week said he would wait for the outcome of several reviews before deciding who should be held accountable. But the results of the VA IG's interim report — along with the findings of an internal audit of the department's medical facilities and increasing calls for a criminal investigation — proved to be too much. "It is with considerable regret that I accepted [Secretary Shinseki's] resignation," President Obama said Friday. The president called Shinseki's service to his country "exemplary" and said he was "grateful." "He is a good man … a good person who has done exemplary work on veterans' behalf," Obama said. But ultimately, the president added, Shinseki's own admission that the VA needed new leadership persuaded the president that Shinseki must step down. "He does not want to be a distraction to getting help to his fellow veterans … and ultimately, I agreed," Obama said. Addressing the Senate Veterans Affairs Committee on May 15, Shinseki called his service as secretary a "privilege," noting that he is able to "care for people I went to war with many years ago, and people I have sent to war, and people who raised me in the profession when I was a youngster." Shinseki, who was nominated for VA secretary in December 2008, was the longest-serving VA head. Coming into office, he made broadening compensation for Vietnam-era veterans a top priority, along with reducing veteran homelessness and cutting the claims backlog. And in those efforts, the department has seen some success. With the rise in the number of veterans from Iraq and Afghanistan as well as older veterans previously shut out of VA care, he added more than 2 million veterans to the department's compensation and health benefits rolls. On Friday, he announced that by some estimates, the percentage of veterans on the streets has dropped by 24 percent in the last several years. But along with these successes, there have been missteps — delays and errors that had prompted conservative critics, media outlets like Time magazine and influencers such as Jon Stewart to ridicule the department and begin calling for Shinseki's resignation in late 2012. The addition of new older veterans into the VA system as well as those returning home from Iraq and Afghanistan overwhelmed the benefits system and the number backlogged claims rose to 600,000 in February 2011. An electronic health records system, intended to be developed jointly with the Defense Department, cost the government $1 billion before it was abandoned in favor of separate systems that could speak to each other. The programs still have not been developed. And the issues with the medical scheduling systems have been known since before Shinseki took office. The Government Accountability Office and VA Inspector General have reported on scheduling problems and prolonged wait times for nearly 10 years. A 2010 memo contained a warning from a a senior VA official to regional medical directors to stop "gaming the system." In December 2012, GAO released the most damning analysis up to that point: a report noting that schedulers at four VA medical centers hid actual wait times, fudged the numbers and backdated appointments to meet timeliness goals set by department headquarters. But through it all, Shinseki quietly toiled outside spotlight, insisting that VA chip away at the backlog, modernize its own electronic health records system and turn to new problems at hand, including veteran suicide. Under Shinseki's tenure, the VA's budget has grown to $164 billion. In April, VA announced that the number of backlogged claims fell below 350,000. The number of veterans getting health care in the VA system has grown to 230,000 a day. Still, the successes weren't enough to save him. "Shinseki is deeply disappointed that bad news [about scheduling abuses] did not get to him," Obama said. Controversy is no stranger to Shinseki. Although he works outside the spotlight, he will be long-remembered for a number of very public decisions. In the Army, he will be forever remembered as the general who made the black beret a standard uniform item, and as chief of staff, he stood at odds with Defense Secretary Donald Rumsfeld over staffing and execution of the Iraq War. Shinseki was commissioned a second lieutenant in 1965 upon graduating from the U.S. Military Academy at West Point. The son of Japanese immigrants in Hawaii, he was wounded three times in Vietnam, earning Purple Hearts for injuries that ranged from mortar shrapnel to his chest and a land mine that destroyed most of one of his right foot. Shinseki became Army Vice Chief of Staff in 1998 and chief of staff in 1999. As chief of staff, the general estimated that several hundred thousand soldiers would be needed to secure a post-war Iraq — figures far higher than were estimated by Rumsfeld and his war planners. He later was seen as vindicated when Central Commander Gen. John Abizaid requested more troops as part of the "surge" in Iraq to quell growing violence. He will be replaced in the interim by Sloan Gibson, VA deputy secretary and former USO president. Gibson is a 1975 graduate of the U.S. Military Academy and a former infantry officer and Army Ranger. Before the White House announced Shinseki's resignation on Friday, scores of lawmakers — including 36 Democrats — had called for him to step aside. 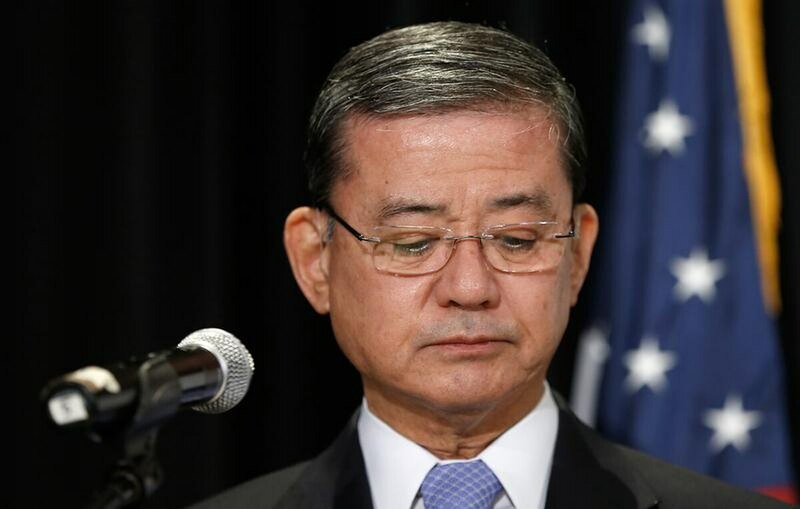 Shinseki's departure is the second in the wake of the growing scandal. Earlier this month, VA Undersecretary for Health Affairs Dr. Robert Petzel tendered his resignation at Shinseki's request, but his departure was seen by many as a meaningless gesture given he was scheduled to retire this summer. On Friday morning, Shinseki said the top administrators at the Phoenix VA hospital will be fired and executive pay bonuses frozen as punishment for the scheduling abuses.